(A) Heating one side of a conductive rod causes heated electrons to move to the other end, creating a voltage. (B) Heating one side of a magnetized nickel-iron rod creates a "spin voltage," with spin-up and spin-down electrons on opposite ends. Image credit: (c)2008 Nature. (PhysOrg.com) -- Physicists have recently discovered that heating one side of a magnetized nickel-iron rod causes electrons to rearrange themselves according to their spins. This so-called "spin Seebeck effect" could lead to batteries that generate magnetic currents, rather than electric currents. A source of magnetic currents could be especially useful for the development of spintronics devices, which use magnetic currents in order to reduce overheating in computer chips, since, unlike electric currents, magnetic currents don´t generate heat. Physicist Eiji Saitoh of Keio University in Yokohama, Japan, and colleagues from other Japanese institutions have published their results in a recent issue of Nature. As they explain, the term "spin Seebeck effect" comes from the original Seebeck effect, a thermoelectric phenomenon discovered by Thomas Johann Seebeck in the 1800s. In the Seebeck effect, heating one side of a conducting rod causes electrons at that end to heat up and move toward the cooler side, creating a voltage. The spin Seebeck effect is similar, but affects electron spin, which is the quantum physics equivalent of north-south magnetic alignment. 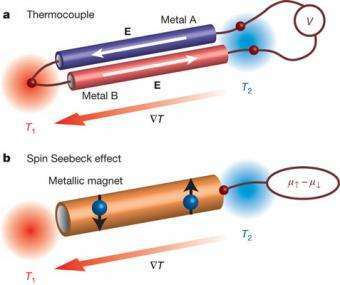 When heating a magnetized metal, such as the nickel-iron rod, the researchers found that electrons with up spins (aligned with the rod´s magnetic field) congregated on the warmer side, while electrons with down spins (unaligned) preferred the cooler side. Essentially, this spin-segregated rod now has two electrodes and serves as the basis for a new kind of battery that produces "spin voltage," or magnetic currents, which have been difficult to produce. With this tool, physicists can work toward developing more kinds of spintronics devices that store information magnetically. Magnetic information storage is inherently more efficient than storing information electronically because there is no waste heat. Unlike electrons that constantly bump into each other, flipping electron spins doesn´t generate heat. Reducing waste heat could lead to computer chip miniaturization, and would also mean lower power consumption and faster operational speeds. "The spin Seebeck effect allows us to pass a pure spin current, a flow of electron spins without electric currents, over a long distance," the authors wrote in their study. "These innovative capabilities will invigorate spintronics research." I guess I better embrace some spintronics research, because this aspect of physical abilities is beyond my understanding. I would have consider superconduction to be the evolution of electronics/computer hardware, but this seems to sidestep the BS of "electronic" information storage altogether. Spintronics is an aspect of Quantum Computing, no? Its great to see this discovery. It really begs the question why it wasn't discovered sooner -- experimenting with heating magnets. I noted that it mentions it was "difficult" to produce so I wonder, besides the heating, what else wasthere that contributed to this discovery. Well, but I have a question: What will happen when we begin to use a "spin current" from this battery? In my opinion spin currents will demagnetize the rod and the battery will stop to work. We can magnetize it again but this means additional energy consumption and heat production. So that, I am some sceptical. Rossen: They said batteries, not free energy devices. Of course they will run down, and of course you will have to charge them up. The advantage seems to be that 1. there would be no waste heat during discharge and 2. there is no unintended discharge, so they stay charged longer (forever?). This is some real scifi stuff here. Awesome. OK I take that back - heres the question - so the hot side repels the down spin, and the cool side repels the up spin, ok. So, after a while however, there are no longer any free electrons left in the magnetic material - where do those new electrons come from? The wire? If from the wire, then why would a heated end of the magnet, attract up spin electrons from the wire thats not magnetic? I think some subjects require the creationist approach. I can't explain it.....therefore God did it with his wand. What an interesting new use of magnets, which none of us thought of before. There is one problem though, and that is that magnets don't respond well to heating, and generally will demagnetize over time if brought too close to their tipping points. This is definitely one that I will be trying out when I get back to work on Tuesday though! Very interesting discovery. I guess one could reduce/eliminate the demagnetization problem by keep magnetizing the nickel-iron rod from secondary magnet(s) insulated from it by induction...then perhaps we have a continuous spin current generator, not a battery, i hope.